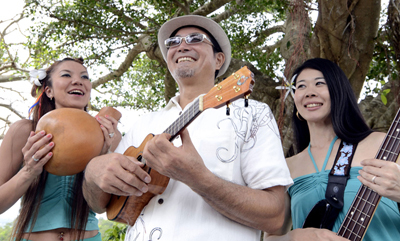 Johnny Ginowan and his Wale Wale has recently found his groove with Hawaiian ukulele music. The official event name is Tropi DE Music Party, but everyone is calling this weekend’s program simply Tropa. Kachimba4 rounds out the program Sunday with salsa. Tropa will also bring together people of many countries for the dance show, music stages and world’s cuisines. Ghanaian, Turkish, Swiss and French food will be there! 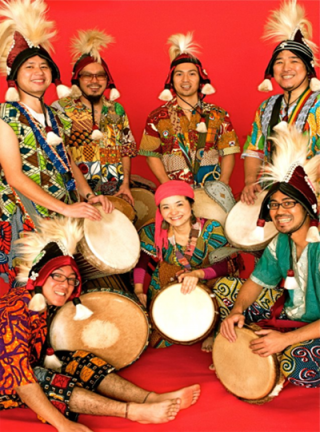 Africasia plays a little more seldom heard, Africa inspired tunes. 3:45 p.m., Glean Piece reggae singers at 4:30 p.m. and sanshin player Kazuya Gibo at 5:15 p.m. Johnny Ginowan & Walewale, a ukulele band, is on stage at 6:15 p.m., followed by Polynesian dance group Puahinano at 7 p.m. 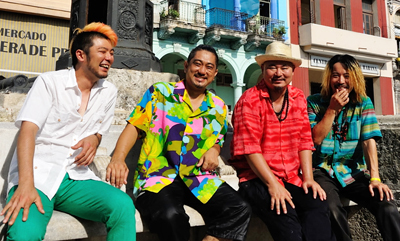 The laser show starts at 7:45 p.m.
On Sunday, Hawaiian dance group Leinani performs at 2:45 p.m., with AfrikasiA playing African music at 4:15 p.m. Atsuko Hiyajo with Tropicalism performs bossa nova at 5 p.m., the Miyagi Sisters & Okinawa Samba BBB demonstrate the samba dance at 5:45 p.m., and the Kachimba4 salsa band rounds out the entertainment at 6:45 p.m. Look for the laser show at 7:45 p.m.